"??????? ???? ???? ?? ????? ???? ???. ?? ????? ??? ??? ??? ?????????. ????? ??? ??? ???? ??? ??? ???? ????? ??????. ????? ?? ????? ???? ?? ?, ???? ?????? ?, ????? ????? ?, ???? ????? ??? ?????? ???? ? ?, ??? ??????? ????? ?? ????? ?????. ????????? ?? ?????? ?????? ?, ?????? ??????????? (Frédéric Bastiat, 1801-1850) ???? ???? ??????? ????? ??????. ?? ????? ?????? ?? ?????? ??? ????? ???? ????? ?-160 ?? ?, ????? ??? ????????? ?????? ????? ??????? ??? ????? ?????????? ????? ??? ?, ?????? ?????? ?? ??????? ???? ??????. ???? ????? ?? ????? ?????? ?????? ??????? ???? ????????? ?? ????? ?, ???????." "?????? ?? ???????? ???????? ?????? ?? ??? ????? ?? ??????????. ????????? ?? ?????? ??????? ???? ?????? ????? ?, ????? ???? ??????? ?? ?, ??????? ?? ????? ?, ????? ?????? ?????? ??? ???????". ????????? "?????? ?????? ????? ?????? ??????" ??? ????? ?'???? "'?? ?????? ??? ???? ????? ?????? ???????!' ??? ????? ?? ????? ????? ???? ???? ????? ??? ?? ????? ?????? ???????? ?????? ???????? ?, ?????? ???? ?, ?? ?????? ?????? ??? ???? ?????". ??????? ???? ?, ???? ??? ???? ??????. Frederic Bastiat's writings are known for the clear and humorous way in which they explain the basic principles of economics. 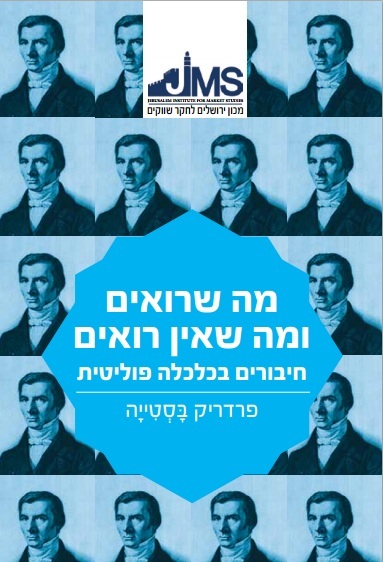 Now, the Jerusalem Institute for Market Studies (JIMS) brings for the first time Bastiat's classics to the Hebrew reader.